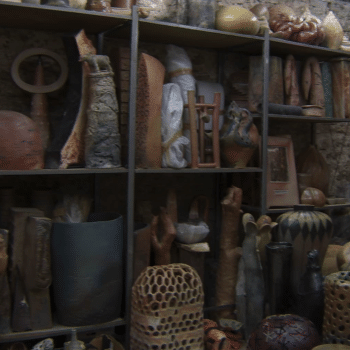 Conversation with Pekka Paikkari, curator of Enchanted by Fire and ceramicist Ingrid Allik. Pekka Paikkari, what were the criteria for selecting the works for the exhibition? Since the collection includes about twice as many works. When seeing the collection at Tohisoo Manor, what provided the greatest impulse for compiling the exhibition? Pekka Paikkari: My wish was to show the works from a sculptural aspect. The dimensions of the works and silhouettes of the forms play an important role in my choices. Also, the selected sculptures resonate well with the white exhibition spaces and with each other. Perhaps the following can serve as crib-notes for the viewers on how to approach the works. They should firstly look at the silhouette, lines and figure. Secondly, at the idea of the work. And thirdly, observe the reaction that the works create in the viewers themselves. Each part of the exhibition in the Tallinn Art Hall has its own character. Please explain briefly what your aspirations were in each space and what the viewer should pay attention to. PP: The main hall is devoted to large sculptures. They surround the viewer and they can be compared. The sculptures are on high pedestals in order to provide an experience that lighter and airier than usual when viewing ceramics. In the room with the window, we see organic forms and objects, as well as containers that are exceptionally large in scale. The room with the small objects on a large table creates a situation similar to one experienced after the oven is opened. In these small rough designs, we see the beautiful ideas and honest creative seeds that are germinated for use in larger sculptures. The artists can readily experiment in small formats. 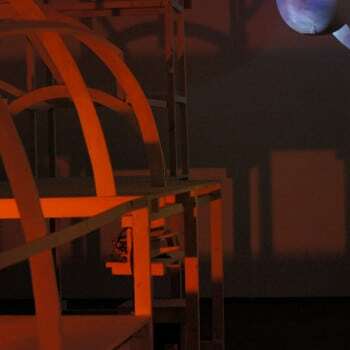 In the last hall, we see Urmas Puhkan’s video installation, which provides an exact model of the Kohila kiln. 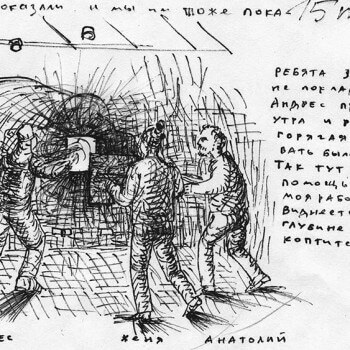 Here the viewer gets an idea of the dimensions and structure the kiln, and even the atmosphere during firing. It also pays to turn one’s attention to the very first wall of the exhibition, where pages from logbooks or firing diaries are on display. These reflect the process and include the entries made by those tending the fire around the clock. You see a historical document that shows that every firing is different. Pekka Paikkari, what do you believe makes this exhibition, the collection and the Kohila International Ceramics Symposium important? PP: The heating of a kiln starts from a spark and after 40 hours of joint work and tending, it achieves a temperature of 1300 ˚C. This noteworthy thing, which has been done in Kohila, plays an important role as the developer of the ceramics culture in the entire region. 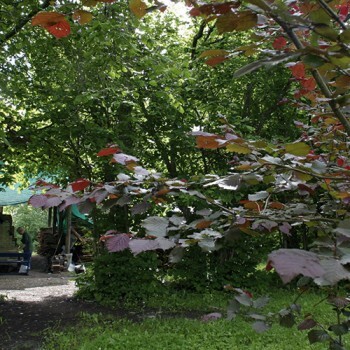 Wood-burning knowhow and traditions have developed in Estonia. The local knowledge and experience is already respected elsewhere in the world, for instance, in Denmark, Germany, the U.S. and Tasmania, where Estonian ceramicists have been invited to speak at conferences. But Ingrid Allik, let’s also talk a little bit about wood-firing! What makes this kiln different? 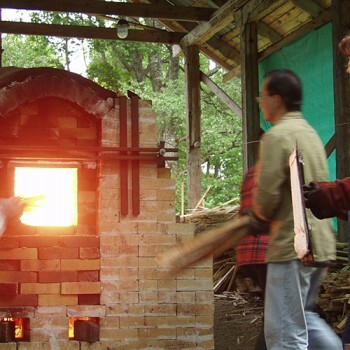 Ingrid Allik: This kiln is the largest anagama-type kiln in our region, which is heated with wood from start to finish – in Estonia, basically with softwoods. 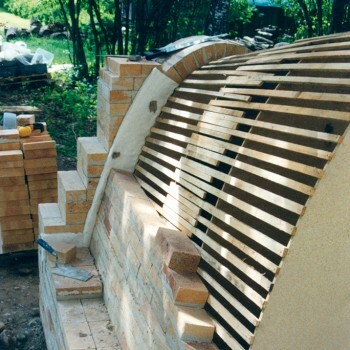 In this type of kiln, the items are in direct contact with the flames. What creates the hue of the items? 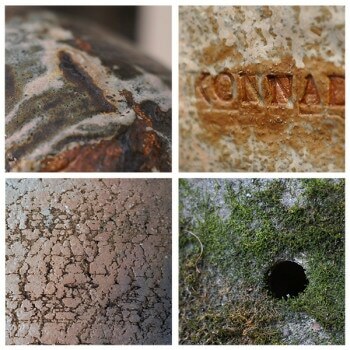 IA: My colleague, Kersti Laanmaa, a member of the technology faculty at the Estonian Academy of Arts, says: “The items are brownish because the glaze that develops on the surface of the clay from the volatile ash in the kiln combined with the iron in the clay creates this result. The places untouched by the volatile ash are lighter in color.” But, if we look closer, we see many more nuances! The surface of a work that has undergone wood-firing can be seen as a landscape or clouds, and many different patterns can be discovered. How would you briefly characterise the aesthetics of wood-fired ceramics? IA: Wood-firing aesthetics can be compared to the beauty of a wooden plank affected by the sun and the wind, moss-covered ruins, or a worn pair of jeans. Wood-firing is collaboration between the author of the work and nature, i.e. between physical forces, the results of which are displayed at this exhibition. Why are cracked or broken items on display? Can this also be interpreted as beauty created by the collaboration of physical forces? PP: I think that the soul and originality of the materials are hidden in the cracks. Flaws, cracks, and breaking – these are things that I play with in my practice. For instance, I make clay floor tiles in this way. I let a large tile break where it wants to. In this way, I don’t have to cut it myself. This is a physical process and something I have discovered after 30 years of practice. Also, when something cracks and breaks, it is moving. When it is broken, the movement ends, the tension disappears. The shelf with broken items and experimental pieces seem to be on an equal standing at this exhibition. On the other hand, we see many artists that are internationally respected in the ceramics world. IA: Yes, there are many well-known names. For example, Estonian Academy of Arts alumni Sergei Isupov, who was commissioned to make a large mural especially for the exhibition; authors who have written books about ceramics-firing technologies, such as Marc Lancet and David Jones; also Priscilla Mouritzen, one of the founders of the Guldagergaard Ceramics Centre; and Neil Hoffman from Tasmania who specializes in wood-fired ceramics, to name only a few. Our own Annika Teder and others are also well-known around the world. 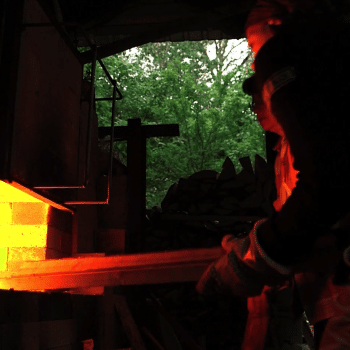 Why fire ceramics in a wood-burning kiln today and why is wood-firing in the Academy’s curriculum? 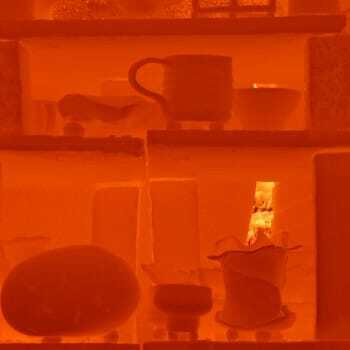 What additional possibilities does such a kiln and firing method provide to ceramicists? IA: The reason is the alternative results compared to an electric kiln, larger dimensions, the experience of international collaboration, exploring and expanding the limits of the speciality and the material, the unique nature of the results and the process itself. It should also be noted that the older and younger generation work together at Kohila. And the latter will be organizing the Kohila Symposium next summer.